I did not know about Vagabonding before my first big trip. I didn’t know anything about traveling, or traveler’s, or resources. I just went. On my first trip, I went to India for six months. I left in December 2005 and my return ticket was for June 2006. I had no idea what would happen during those six months, whether I would make it to June, or whether I would even survive at all! Since then, I’ve been back to India bout six times, and have spent about 17 months’ altogether traveling in India, most of it by myself. On my first trip, I had planned out a couple of things, but most of my itinerary was open. I was enrolled in a yoga studies program in Chennai, south India, for one month and accepted as a volunteer for one or two months in a program for Tibetan refugee children in Dharamsala, in north India. Otherwise, I had no fixed plans and just want to explore the subcontinent. While I was trying to recover from grief and depression over the deaths of my parents and the break-up with my fiance, I decided to follow a dream and become a yoga teacher. 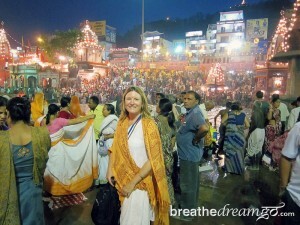 During the intense training process, with a teacher who had trained in India, I suddenly felt compelled to go to India. It felt like the thing I had to do to save my life from a downward spiral. So, even with doubt and apprehension looming in my mind, I started saving and planning. I sold 1/3 of my belongings, gave up my apartment, and moved to a small room in someone’s house. I saved $10,000, it took nine months, and then I left. Everyone always asks me what’s my favorite place in India! I find it a very hard question to answer. India is so varied, with some of the world’s highest mountains, one of the biggest deserts, and thousands of miles of ocean coast lines! However, if pressed, I will admit to loving the desert of Rajasthan, the mountain hill stations, Sikkim, the Rishikesh area, Delhi, Mumbai and the beaches of Kerala. Sorry, can’t narrow it down further! I was appalled at the conditions in Agra, home to the Taj Mahal — the world’s most beautiful building. There must be so much money pouring into that city, and yet none of it is spent on infrastructure or tourism. Thanks goodness they are at least preserving the Taj, the fort and Fatephur Sikri. But it does make you shake your head. I was disappointed by some of the sacred places in India turning into “traveler’s haunts” and catering to foreign tourists, mostly backpackers. I understand that tourism is good for the economy, and I see the efficacy in serving pancakes at the Pink Floyd Cafe in Pushkar … but it’s still disappointing. Especially when you see foreigners drinking beer in Pushkar, which is a sacred city and supposed to be alcohol free. There is a dark side to tourism. India is itself quite challenging, and it challenges you on every level of your being. However, if you go with a certain attitude, the attitude of the seeker, and see everything that happens as a lesson, you can turn difficult circumstances into transformative experiences. Personally, that’s how I approach India, and it works for me. Haha, I brought a whole bunch of stuff that proved ridiculously un-useful the first time I went. The Indian family I was staying with laughed at my large medical kit that included syringes, portable mosquito net, and stack of pills for preventing things like malaria and diarrhea. Unfortunately, the travel medical clinic I visited in Canada scared me into thinking I was heading into a dangerous and wild place. Of course I discovered that India has modern medical facilities and I soon realized I didn’t need half the stuff I brought. The rewards are probably different for everyone, but for me, I feel that I am doing what I was put on earth to do; I am following my “bliss,” my unique path. Traveling, especially in India and South Asia, makes me feel totally alive. It inspires my creativity and satisfies my adventurous spirit. You have to give up being bored. 1. Personal. I gained an enormous amount of much-needed confidence and a much broader perspective. 2. Global. I became a “citizen of the world,” and gained a much better understanding of my place in the world, and about how perspective plays such a huge role in how we see things. 3. Spiritual. 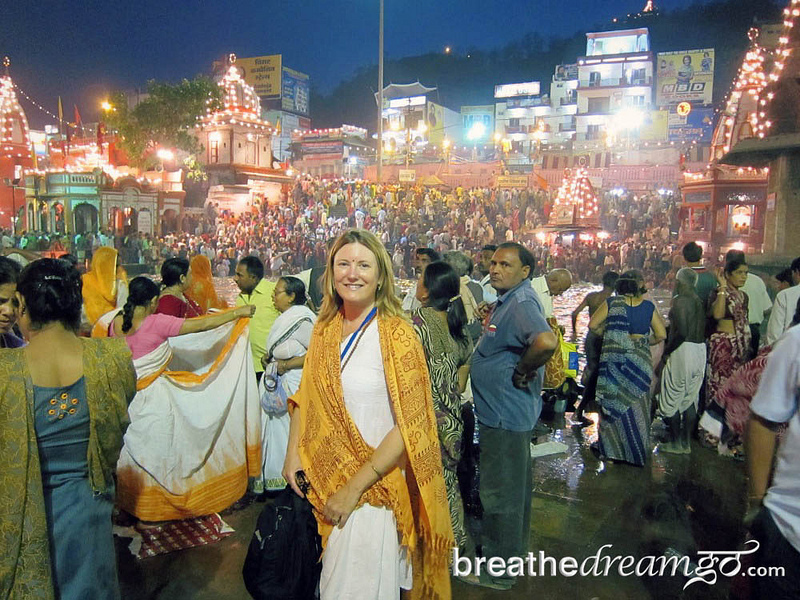 I consider myself a seeker, and have immersed myself into the spiritual ideas and traditions of India, especially yoga. Most westerners don’t realize that yoga is a complete system, an art and science, and a way of being in the world. The west has reduced yoga to a system of exercises, but it is much, much more. So opening myself up to the spiritual teachings of yoga has been a huge part of my journey. I didn’t really have a notion of vagabonding when I first started traveling. I was trying to save my life from an entrenched depression. Then I fell in love with India, and began a love affair, with all the typical stages of drama. Now I see myself as a cultural explorer. Don’t worry. Enjoy the trip, every moment, even the difficult ones. Everything always works out the way it is supposed to. My advice is don’t go on a similar adventure. Go on YOUR adventure. Follow YOUR bliss. Listen to YOUR heart. When King Arthur sent the grail knights into the forest to search for the Holy Grail, he instructed them to enter the forest at the darkest spot, the place where there is no path. You have to find your own path to win the Holy Grail, and whatever that represents to you. I’m hoping to get enough support to conduct training sessions with groups of women and teach them how to use the Internet. The company that makes the Aakash, the world’s cheapest computer tablet, has agreed to donate some so I can hand them out. The more I travel, the more my interest in travel shifts from ‘what’s in it for me?’ to ‘what can I do for others?’ I think that’s probably typical. You see how big the world is and how small you are, and it has a profound impact. Which is ultimately probably the biggest gift of travel.